The Babbitt LG-Series magnetic level gauge consists of a float chamber, a float, and an external indication device. The float chamber is basically a column of 2 1/2 inch pipe with process connections to match those of the storage tank, reactor, drum, column or other equipment where level is to be measured. These connections may be side couplings or flanges, or top and bottom flanges. The float moves up and down inside the chamber as the process level changes. The float type is determined by the process fluid specific gravity, pressure and temperature. Also, the materials of construction must be compatible with the process fluid. The float must be light enough to maintain buoyancy and have properties that allow it to withstand the pressure and temperature combination. Each float is engineered for proper buoyancy for each particular application for level or interface measurement. Contained inside the sealed float is a very strong magnet assembly. 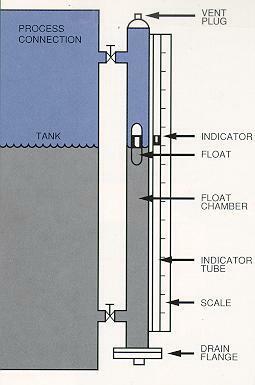 The indicator tube and scale assembly is attached to the outside of the float chamber. Inside the transparent, hermetically-sealed indicator tube is a light-weight magnetized indicator. This indicator is magnetically coupled with to the float and moves up and down inside the indicator tube as the float moves up and down with the rising and falling of the liquid level in the vessel. The indicator is brightly colored and allows the operator to read the level from 100 feet away. The only moving parts are the float and the indicator. An optional Flipper/Roller style indicator is also offered. 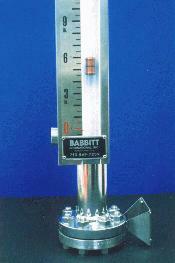 The basic Babbitt magnetic level gauge offers simple visual indication. By using the LT1 transmitter, a 4-20mA signal can be sent to a remote location for indication or control functions. Additionally, level switches can be added, external to the float chamber, for alarm or control. These switches can easily be moved up or down the chamber while not disturbing the process. The Babbitt LG-series level indicator uses a time-proven method to indicate liquid levels which offers many advantages over conventional sight glasses or electronic level sensors. In cases of extreme pressures and temperatures, or corrosive and hazardous materials, these gauges perform where others fail thus eliminating dangerous situations for plant personnel. The standard material for the LG-Series float chamber is 316 Stainless Steel, however it can be made of any non-magnetic material that is compatible with the media being measured. Rugged construction for the roughest industrial applications. These products perform in high temperature, high pressure, high vibration and many other applications requiring sturdy, high-quality design. Safe non-leak replacement for sight glasses. Add-on continuous level transmitter for control or remote indication. Add-on switches for alarms and level control. Calibration and maintenance on transmitter and switches can be done without disturbing the process since they are mounted on the float chamber - external to the process. No re-doing of piping to change a level setpoint. These level gauges may be widely applied for many kinds of extreme applications. They may also be used in interface applications such as foam/liquid and oil/water.